I’m not a psychologist, but I do believe human behavior is made of habits. It’s one of mine go every morning to a bakery next to my home and buy fresh bread. At this bakery, I can exercise one more habit I have: To watch other people habits! And something that I’ve noticed in this place is how the owner organizes and takes care of his products everyday. Talking to him he said: I always organize my store thinking as a customer and how to create the best impression. This statement triggered in my mind a quote from Aristotle “We are what we repeatedly do. Excellence, then, is not an act, but a habit”. But on the other hand, when we talk about e-commerce, it’s common to see owners who believe that just an online store with good products and prices are enough. In a world where half of North Americans said they most frequently purchase from online-only stores , according to the “Global Trends in Online Shopping” by Nielsen (http://www.nielsen.com/us/en/insights/reports-downloads/2010/Global-Trends-in-Online-Shopping-Nielsen-Consumer-Report.html), the bakery owner’s habit is really important. Yet why do e-stores exist and still many not provide a good user impression? I can say, for sure, because the owner doesn’t have the constant improvement habit! Some owners say: It’s too complex! I’m not a web designer/developer and my budget doesn’t afford one. But even with some technical limitations, there is always something that you can do! I like to keep concepts and principles in a simple manner, so my advise is: Think of your online store as a real world store and when you plan on doing something, place yourself from the customer point of view. And when you evaluate something in your store, for example a menu, instead of “Is this menu easy to navigate?” ask yourself “Can I easily find what I want?” . Yes…So, where should I start my analysis? You may ask..
From the beginning! 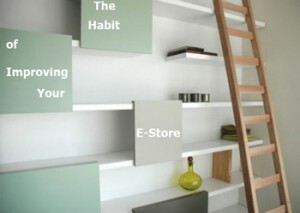 First ask yourself how does your e-store fits in your business model. What do you want to achieve with your e-store? Why should a customer buy from your store? How do special offers work in your store? Having a clear idea about what your e-store is, and the most important, what your e-store is not, is the cornerstone on choosing what content you should have in your website. Then, think about how you can categorize your content in a way that is easy for the customer and is also aligned with your business model. What do you have that attracts the customers? Is message that clear in your e-store? What about your store appearance? Is it attractive to your visitors? And when you compare with some competitors, does it still stand out from the rest? This subject of ecommerce usability is so broad that even one book alone is not enough to cover everything. Of course my point here is not to write a Marketing 101, or discuss on how to manage a e-store. I just want to plant the continuous improvement seed and show that there is always something we can do to improve our site. If you have any e-stores and what to share with us your story or questions, just send us an email! Or at least, try to help me feed my habit of talking to people. Web developer interest in e-commerce, interfaces, and someone with a lot of habits!